As summer comes to a close, it’s not too late to install a beautiful new fence for your home. Although spring is most often associated with outdoor home projects and repairs, fall is just as great of a season for working on home improvement projects outside. As summer comes to a close, it’s not too late to install a beautiful new fence for your home. With high-quality materials to choose from and an excellent installation team, you can have your fence installed after labor day with plenty of time to enjoy your outdoor space in the coming months. If you are considering adding a new fence to your home in September, consider the many reasons why fall is an ideal time of year to install your new fence. The off-season for home improvement projects presents you with a perfect opportunity to have your fence installed in a timely manner. In addition to the slower schedules of your installation team, you may also have an easier time receiving any permits required for your installation following the summer months. With your fence installed as soon as possible, you can continue to enjoy your outdoor space well into late October in Maryland. The cool and crisp weather of fall is just as ideal for your new fence installation as spring months. 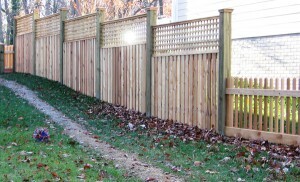 With minimal rain and humidity, fall is perfect for getting your new fence set up in your yard. This will allow you to have your yard prepared for winter before the ground begins to freeze. Because your landscape will be mostly dormant by early October, scheduling a fall fence installation allows you to freely work within your yard without causing damage to your landscape in its prime season. The timing will also allow you to freely rearrange your landscape design if needed so that your new flowers and plants can grow and thrive within their new locations for the following spring.